"They were more concerned about helping people"
International aid is still being rushed to the Philippines following one of the worst storms on record in the region. Typhoon Haiyan made landfall November 7, killing thousands and displacing close to two million people. Governments and relief agencies are jostling for flights and cargo space even as they're determining who will oversee emergency aid in which areas. But while external efforts struggle through a bottleneck of limited runway availability and destroyed roads, local Filipino congregations are sacrificially reaching out to their neighbours. "It is not a question of how the Church is affected, but more how the Church is responding," says John McAlister, communications director for The Salvation Army in Canada. "People in the Church have significant needs affecting them, but there is very much a sense of offering support to their neighbours, their communities and other areas around the country. It is very much a sense of mobilization and responding to the people." As reports of the destruction began rolling in, The Salvation Army immediately offered $100,000 in aid—mainly food, water and medicines. However, McAlister says most of that relief distribution is being carried out by local Salvation Army church members. "Within days of the disaster there were people dying for lack of food and water," he explains. "Those are really basic needs, and it's something that is easy for church members to help out with. Whether it's as simple as giving out water and sandwiches, that is something our local people are doing." Available cargo space isn't the only problem with importing aid, distribution remains difficult because many roads have been destroyed. But despite their own food and water shortages, McAlister says local churches immediately began helping however they could. "We have been active in the Philippines since the 1930s and The Salvation Army in the Philippines had a disaster preparedness plan in place, which allowed us to respond effectively." As of December 1, 2013, the death toll was nearing 6,000 with government officials estimating it will reach more than 10,000. The UN estimates almost 2 million people have been displaced by the storm. 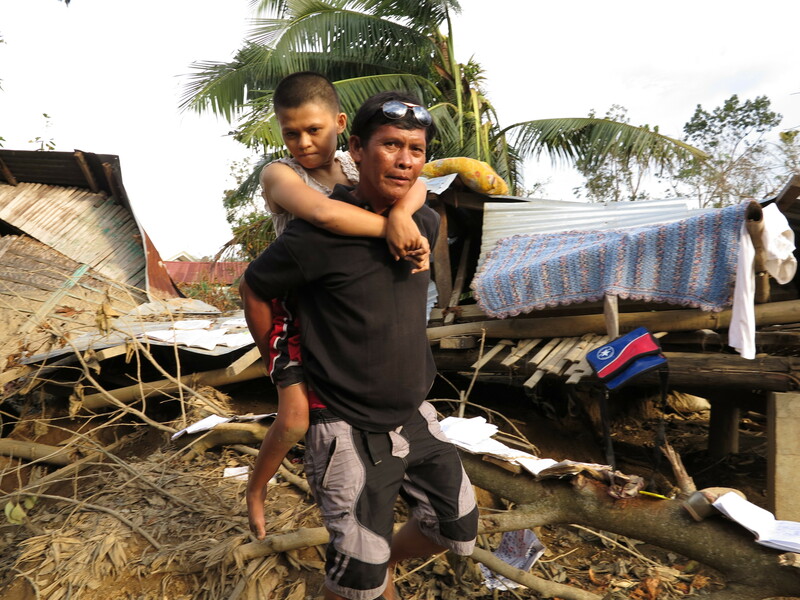 "...Before, when we shared the Word of God, we were rejected, but now they are coming to church..."
"The Church in the Philippines has been hard-hit by the typhoon," says Kara Boda, communications advisor for Samaritan's Purse Canada. "Countless buildings were levelled, including many churches. The typhoon had no mercy, ripping apart nearly every house in its swath of destruction." Yet even while the storm raged believers were reaching out. John Du, a Roman Catholic archbishop in one of the worst hit regions, weathered the storm with 500 community members sheltered in the church. Relating the experience to Samaritan's Purse staff, Du said, "you go beyond your feelings. I had to serve and save all the children and elderly who were looking to me at that terrible moment." Samaritan's Purse has been deploying disaster response teams and cultivating local partnerships in the Philippines for more than 15 years. As the stories began rolling in, they mobilized local pastors and volunteers to distribute more than 110 tons of relief supplies. Even while supplies were still being shipped, their teams distributed 8,000 hygiene kits Samaritan's Purse was housing locally in the Philippines. A Samaritan's Purse blog about their efforts says believers are helping materially, but also sharing the gospel. One pastor is quoted saying, "before, when we shared the Word of God, we were rejected, but now they are coming to church." The blog continues, "many of the volunteers were also victims of the storm, but they were more concerned about helping people who had lost everything." Compassion International has offered child sponsorship programs through local churches in the Philippines since 1972. Steve Clarke, program director with Compassion Canada, says approximately one third of the 67,116 Filipino children in their program have been impacted. Almost 4,000 of those are sponsored by Canadians. "There needs to be sustained effort to protect the children and women who are most vulnerable in times of disasters," Clarke states. "Every effort is being made so that makeshift tents and relocation areas are protected from child trafficking syndicates who pretend to offer help, but induce parents to give up their children in the guise of adoption." Philippines after typhoon Haiyan, November 2013. - Manith, 21 years old is the daughter of Manuelito. She has cerebral palsy. Typhoon Haiyan hit their village: Barotek Viejo is a small town on the coast of Iloilo province in the Philippines. His house was wiped out and he had to carry Manith on his shoulder in the typhoon to find a shelter. They are now safe, but they lost everything. Photo courtesy of cbm Canada. "One of the realities of this kind of devastation is that it disproportionately affects people with disabilities," says Epp. "People with disabilities can't flee the same way as other people. We are getting reports of families who couldn't leave because of a disabled family member and those are terrible choices to make." Epp says in one case a father carried his daughter, who has cerebral palsy, for more than two kilometers to escape the flooding. The whole way the father worried she would slip off his back and drown. But many didn't have the means to transport their loved ones. "If it's a child it's one thing, but if your father has a disability, you can't carry him," says Epp. McAlister says getting enough financial support is crucial to partnering with local churches and saving as many lives as possible. The Canadian government has promised to match any support raised by Canadian charities towards relief efforts between November 9 and December 23, 2013. "The other thing is to continue to offer prayer support," says McAlister. "Pray for the people who are in need, families that have been separated, people who have lost loved ones and people who lost their livelihood."